The Secretariat for Communication released a photo of a letter, with two lines at the end of the first page blurred out. This letter was written by Pope Emeritus Benedict XVI; the blurred part indicated that Pope Benedict had not read the series of books on Pope Francis. Thus, only the words defending Pope Francis on the fifth anniversary his election remained. The series by the Vatican publishing house, Libreria Editrice Vaticana, included 11 books focusing on the intellectual roots and thought of Pope Francis. 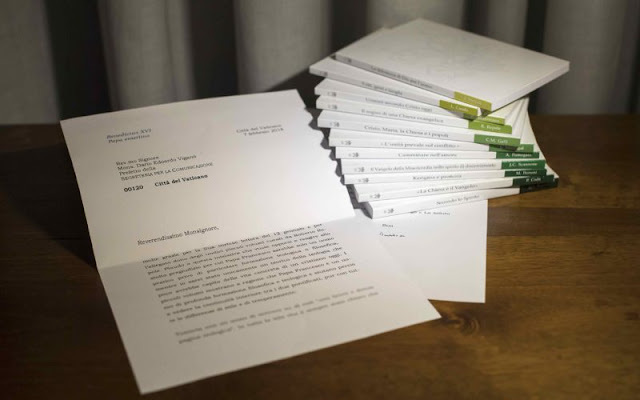 The Vatican explained that the letter itself was never intended to be made public. At a news conference, Mgr Vigano read out loud the lines that were subsequently obscured.